Historically, when main stream non-financial magazines begin to focus on the financial markets, the end of the current trend is near. Simply, this is similar to the proverbial "shoe shine" boy giving stock tips in that it suggests the trade is getting overcrowded and complacent. The last time (for lack of a better word) Time Magazine dedicated its cover to the economy was March of 2009. You might recall that March of 2009 was the depths of the financial crisis, and acted as the springboard for a magnificent multi-year rally in the equity markets. Will the "cover jinx" strike again? Will we get a hiccup in the bull run? Most analysts were shocked to hear that the Fed didn't begin to taper its bond buying programs. However, the Fed never said that was the plan...the market did. The Fed has always stated that it will taper when the economic data calls for it; which they expected to be sometime in late 2013. For whatever reason, the market and its pundits assumed it would be in the September meeting. Ironically, the same transparency that was supposed to eliminate market volatility is creating it. The Fed has not taken any action, nor confirmed any timeline of action, yet the S&P has traded violently between 1560 and 1720, and Treasuries have collapsed, as traders try to predict the next move. Plainly, things have just gotten silly. It feels like yesterday's moves in the equity market and currencies was some sort of QE capitulation in which the markets priced in a never-ending morphine drip from the Fed. Accordingly, we are cautiously leaning in the opposite direction from here on the theory that the markets have likely overdone things. Tapering didn't happen this meeting but it is still on the horizon. What a difference a few days make. A week ago Treasuries were the dogs of the market. Expectations of QE tapering left most small speculators on the short side of bonds and notes. Keep in mind that the financial markets have been pricing in "taper talk" since May. Now that the Fed passed on its opportunity to do so, speculators might finally abandon the practice of predicting the Fed and get back to a more "normal" market. If so, this might only be the beginning of the Treasury rally. Things have really gotten out of hand in the financial markets. Emotions are trumping logic and fundamentals; this can be a recipe for chaos down the road. A good friend and experienced trader noted that he felt a black swan type of move coming in the equity markets. We aren't doom-sayers but we must say such a scenario wouldn't be shocking. 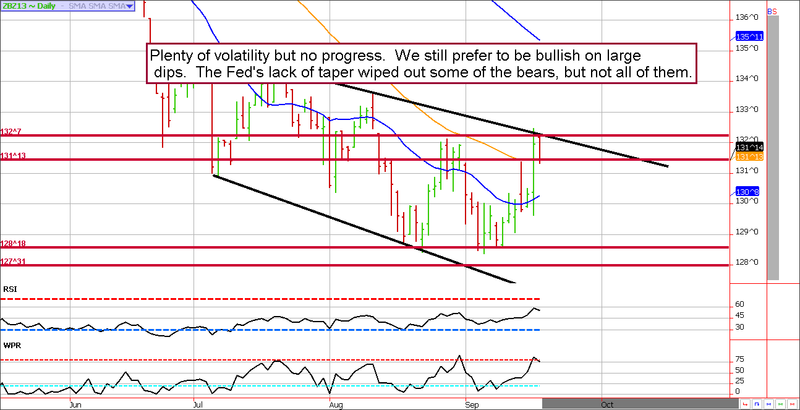 Accordingly, we prefer to avoid any open-ended bearish plays in Treasuries. **Consensus:** Look for some back and filling, but the best trade is likely from the long side on large dips. Watch the noted support levels below. Wow, we were looking for a short squeeze but this is wild! We were anticipating a move above 1700 in the ES, and possibly even 1713 but the relentless move into mid-1720's was rather shocking. Naturally, being shocked is part of trading. Despite the poke well above what was within our realm of possibility, we continue to feel like the market is moving on emotion. During such times, prices are vulnerable to large corrections simply because the motivation to buy fizzles once "all" of the shorts are out and "all" of those waiting to get in have finally entered the market. That time might have been yesterday. 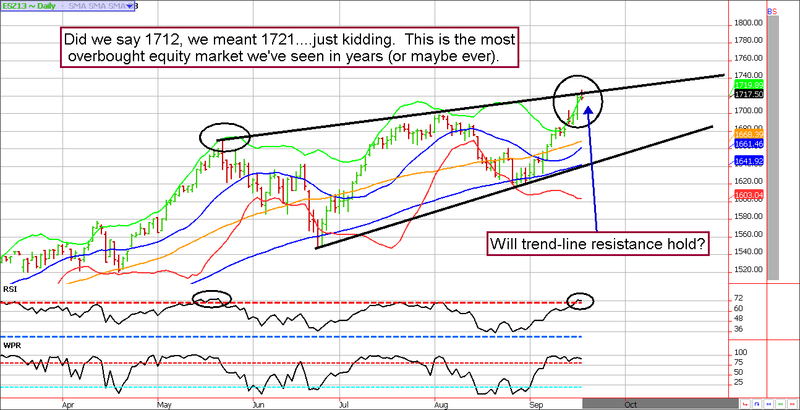 Only time will tell how this plays out, but we certainly wouldn't want to be long the market in any way. If you want to be a buyer, make sure you have protections in place. Once the air is let out of the tire, the hiss will be loud. On a side note, we feel like the U.S. dollar might be near an intermediate term low. If we are right and the greenback finds a way to rally, this alone will put pressure on stocks. Keep an eye on the currency markets! **Consensus:** We are cautiously bearish. If you have to be long, make sure you have a hedge. If you want to be short, give the market some breathing room...both the bulls and the bears are prone to panic up here. September 16th - Sell October ES 1730 calls for about 10.50 ($550).